Discovery: Fajans & Gohring 1913; Fredrich Soddy, John Cranston, Otto Hahn, Lise Meitner 1917 (England/France). Protactinium was not isolated as a pure element until 1934 by Aristid von Grosse. Word Origin: Greek protos, meaning 'first'. Fajans and Gohring in 1913 named the element brevium, because the isotope they discovered, Pa-234, was short-lived. 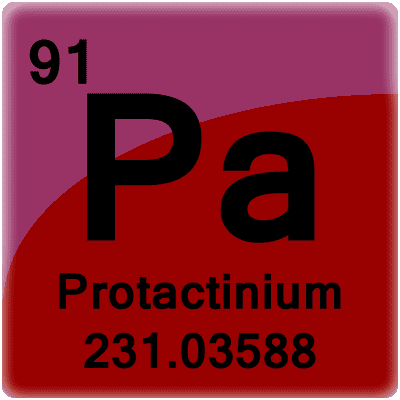 When Pa-231 was identified by Hahn and Meitner in 1918, the name protoactinium was adopted because this name was considered to be more consistent with the characteristics of the most abundant isotope (protactinium forms actinium when it radioactively decays). In 1949, the name protoactinium was shortened to protactinium. Isotopes: Protactinium has 13 isotopes. The most common isotope is Pa-231, which has a half-life of 32,500 years. The first isotope to be discovered was Pa-234, which was also called UX2. Pa-234 is a short-lived member of the naturally occurring U-238 decay series. The longer-lived isotope, Pa-231, was identified by Hahn and Meitner in 1918. Properties: The atomic weight of protactinium is 231.0359, its melting point is < 1600°C, specific gravity has been calculated to be 15.37, with a valence of 4 or 5. Protactinium has a bright metallic luster which is retained for a while in air. The element is superconductive below 1.4K. Several protactinium compounds are known, some of which are colored. Protactinium is an alpha emitter (5.0 MeV) and is a radiological hazard which requires special handling. Protactinium is one of the rarest and most expensive naturally occurring elements. Sources: The element occurs in pitchblende to the extent of about 1 part Pa-231 to 10 million parts ore. In general, Pa only occurs at a concentration of a few parts per trillion in the Earth's crust. In solution, the +5 oxidation state quickly combines with hydroxide ions to form (radioactive) hydroxy-oxide solids that stick to the surface of the container. Protactinium has no stable isotopes. Handling of protactinium is similar to that of plutonium, due to its potent radioactivity. Even if it was not radioactive, protactinium would present a health risk because the element is also a toxic metal. The largest amount of protactinium obtained to date was 125 grams, which the Great Britain Atomic Energy Authority extracted from 60 tons of nuclear waste. Although protactinium has few uses aside from research purposes, it may be combined with the isotope thorium-230 to date marine sediments. The estimated cost of one gram of protactinium is about $280.